Our office is blooming and our dental practice is looking for energetic and highly motivated individuals who are looking for a rewarding career working with patients of all ages in a fun-loving environment. Our dynamic team provides an exceptional and satisfying dental experience using state-of-the-art equipment and techniques. Candidates must display a friendly and positive attitude with patients, patient families, and team members plus have strong time management skills. These positions offer the successful candidates potential for future growth within the practice and we offer flexible schedules between 25-40 hours per week. We are committed to providing the highest level of Dental Services in Richardson Texas for both our patients and our staff. We are now accepting applications from those who are interested in joining our staff. Please use the form below to send your information. Willing to be cross-trained in all areas of the office! 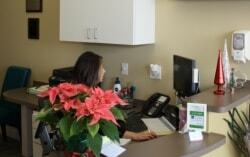 The Front Desk – Patient Coordinator is an essential link between the patient and the office staff.